Every once in a while I still get a few zealots from the long-ranger camp coming to the defense of Sergei Starostin's work with misguided and condescending comments to the effect of "How dare you criticize Starostin!" and "But look at all these correspondences". As to the first line of reasoning: a theory above rational criticism is called a cult. I don't do cults nor do I respect their followers. I also find it frustrating to talk to someone that persists on confusing academic criticism with personal attack and by so doing, creating arguments out of nothing. As to the second line of reasoning, it's the very implausibility of Starostin's correspondences that I object to, so showing me more of his paltry 'sound correspondences' is only being irritating and grievously wastes all of our time. Recently, this letter was about the origin of Japanese numerals and it was evident that the commenter failed to absorb any of the simple facts I explained in The hidden binary behind the Japanese numeral system. So with guiltless glee I dropped his comment in the wastebasket with all the other troll trash. However, it's a chance to gloss over more pedantic silliness written by doctors of linguistics who should know better. Be brave; be self-sufficient; be curious; open your eyes wide and keep your brain closed to fantasy. On page 341 of Choi, Japanese/Korean Linguistics, Vol. 3 (1993) (see link), in the article Notes on Some Japanese-Korean Phonetic Correspondences by Alexander Vovin, we see a list of reconstructed numerals comparing Proto-Japanese, Proto-Manchu-Tungus and Proto-Altaic. Notice, reader, how Proto-Japanese *mi 'three' is claimed to come from *ñi and that the attachment of *[ñ] to the Proto-Manchu-Tungus etymon is unexplained and ad hoc, together with the fact that a change of [ɲ] to [m] neighbouring a front high vowel is absurd and completely unmotivated from the perspective of rational notions of phonology. Compare also Starostin's *ŋ[i̯u] with Vovin's *ñïl₁ï and how fellow Altaicists aren't agreeing even on numerals or which cognates to use. We're led to believe that *mu 'six' is to be from *ñu as well and one might remark how curious it is that so many marked phonemes are being reconstructed for simple number terms. God knows why both his *-l₁ï in Altaic 'three' and *-ŋu in 'six' so conveniently disappear in Japanese, why *ñ- in '3' and *i- in '5' need to be added in Proto-Manchu-Tungus to smooth things over, et cetera ad absurdum. Indeed, maybe only God could explain such absurdity; one absurdity for another. Meanwhile, the *d- in 'four' and the same *d- in 'eight' are derived from different sources which, by doing so, ignores the unignorable vowel harmony inherent in the attested Old Japanese set (ie. mi- '3'/mu- '6'; yö- '4'/ya- '8')! No reasonable person can claim credibly that the consistent 'binary' pattern in Japanese numbers simply happened by chance from originally dissimilar roots as Vovin, Starostin et alia are effectively claiming by the shape of these reconstructions. In other words, theory trumps facts just like we find in all religions. It's amazing what gets passed peer review (assuming such a thing was ever effective in weeding out nonsense). I've read many people writing of 'prefixes' in Minoan but I frown on these notions. Yes, I know, I'm a party-pooper but I don't like things that make no sense. Knowing nothing else about this undeciphered language (and believe me, no one really knows much on this language unfortunately), it should be understood that 90% of world languages are either SOV or SVO. Of the two, SOV is the most common word order overall and with this word order comes the strong tendency towards suffixing with very few prefixes. For example, in Proto-Indo-European the only prefix I can think of offhand that is securely reconstructed is privative *n̥- (nb. the past augment *h₁e- was only dialectal variation). The fact that prefixing languages are less common than suffixing ones should alone be enough to dissuade people into looking for genuine prefixes in this language until everything else is better understood. I'm happy to note that Andras Zeke finally resurfaced with his latest post, More on the libation formula - the statuette of Poros Herakliou. While it's another interesting post full of fresh points of view, I have to comment on the idea that, concerning U-QE-TI, "the 'U'-prosthetics might have been verbal formatives in the Minoan language". John Younger too mentions prefixes, citing Yves Duhoux. The YA-/A- alternation in Minoan is merely a reflection of the phonotactically motivated avoidance of word-initial semivowel /j/. The same constraint was coincidentally in effect in Etruscan. The differences seen between YA-SA-SA-RA-ME (IO Za 6) and A-SA-SA-RA-ME (PK Za 11) then don't involve morphology but rather spelling preferences and there is then no need to define a function for this 'prefix' that's in effect imaginary. The related I-prefix that is supposed is effectively only demonstrated by a single pair, I-DA-MA-TE (AR Zf 1, Zf 2) versus DA-MA-TE (KY Za 2), but isn't sufficient evidence since a single spelling aberration can't rule out other possibilities like syncope or scribal error. No such suffix. It must be first established by identifying pairs with and without the morpheme. The argument that "words beginning with U- are relatively rare" isn't enough in establishing such a prefix. This is surely not a prefix. It's a preposed distal demonstrative *tan, declined in the accusative case and identical to that found in Etruscan. Thus TA-NA-SU-TE-KE (PR Za 1) is two words, *tan suteke, the direct object of the phrase in question. So I thus far deny all prefixes in Minoan. Blake, Case (2001), p.99 (see link). Fuss, The Rise of Agreement: A Formal Approach to the Syntax and Grammaticalization of Verbal Inflection (2005), p.153 (see link). Linear A Texts: Homepage - 13c. Prefixes. In prior posts, I've been babbling about all these meanings applied to *mar-, *mer- or *smer- by Indo-Europeanists and how skeptical I am of one particular set of meanings in this clumsy word pile, that revolving around the notions of 'shimmer' and 'shine'. I recently found an instructive account of this whole messy group of words, published in French: Skoda, Le redoublement expressif: Un universal linguistique. Analyse du procédé en grec ancien et en d'autres langues (1982), pp.120-2. I strongly suspect that there lies an Aegean root underneath this and it has nothing to do with Proto-Indo-European at all. However with what little we know of the Aegean group (ie. Etruscan, Lemnian, Minoan, etc.) and with some even denying that such a group exists, etymologists don't seem to be getting very far here. Half-solutions everywhere; nothing tied together very well. Let's cut to the chase and propose something bold and new. 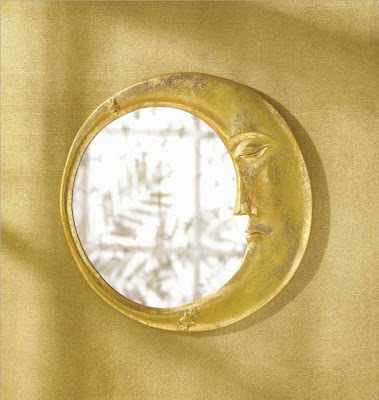 Let's say for a moment that there's a Proto-Aegean verb *amára 'to reflect, to shine'. Let's say that it remained unchanged in later Minoan. Let's also say that this same root however was reduced to Proto-Cyprian *mar from which we should expect the same in Etruscan, Eteo-Cretan, etc. Let's then run with this and say that there's a derivative *amária meaning 'reflection, shine' which is again preserved in Minoan while reduced to *mera in Proto-Cyprian. From 'reflection' come the notions of 'appearance' and 'face' in a similar fashion to that of Japanese 色 (iro) 'colour; appearance'. It's difficult from an Indo-European point of view to explain 1) the unusual reduplication, 2) the vocalism in -a-, and 3) the curious application of prothetic a- which Robert Beekes has identified (I believe, rightly) as a hint at a 'Pre-Greek' (ie. non-Indo-European) origin. To me, the prothetic a- is not a genuine prefix but is due to the presence or absence of syncope between different Aegean dialects and time periods. If one is still skeptical, Hesychius was kind enough to add the gloss μέρα (méra) in his work Glossai which he equated directly with ὄμματα (ómmata) 'eyes'. The 'eye' was used in Greek to also refer to the face as a whole, as with ὤψ (ōps). Consult for example Beekes' Greek Etymological Dictionary under ἀμαρύσσω. A few years ago, Bradshaw of the Future etymologized Chimaira, a three-headed monster of Greek legend. It was the correct etymology as far as status quo answers are concerned and we find the same, boring origin story repeated several times in several books and in several websites in several languages. If it's repeated 1000 times, it must be correct, right? (Just like the flat earth theory or Intelligent Design.) What personally irritates me about this standard etymology for Chimaira is that it only appears on the surface to give us a solution while leaving us with even more questions. Granted, the idea is seductive that Greek χίμαιρα chimaira could simply be a feminine form of χίμαρος chimaros 'he-goat' and ultimately related to χεῖμα cheima 'winter' (ie. 'winter goat', as in a young goat that experiences one winter, hence a one-year-old goat). Yet, what the hell does this really have to do with the three-headed monster of the same name?? 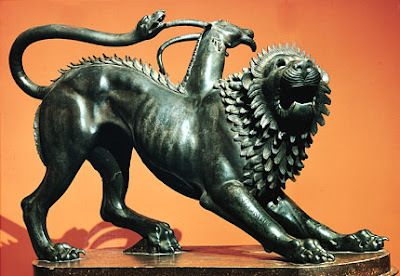 As you can see in the picture above of the Etruscan bronze artwork known as the Chimaira of Arezzo which is closely related to the Greek images of the monster, only one of the three heads is that of a goat, the other two being those of a lion and of a serpent. It's an unresolved onus on the part of these etymologists to satisfactorily explain how any of the words implicated in Chimaira's etymology really fit together smoothly. I smell a folk etymology. Meanwhile, for me, the Etruscan Chimaira brings up an important question: What was the word for Chimaira in Etruscan? Surely they had a word for it. Perhaps it was the same as the Greek or similar? It may seem like a silly question, and perhaps it is, but it's led me down an interesting path to a new etymology for this name. If I get into the shoes of an Etruscan for a moment and speak the name Chimaira, I find it unavoidable to hear in it the Etruscan word ci 'three'. The monster has three heads afterall. Could it be that this is not a name of Indo-European origin but of Aegean origin? Could it have meant something like 'three-headed' or 'three-faced' and only later associated by Greeks with native words like χίμαρος and χεῖμα? "Another etymology, proposed in Böhtlingk's Dictionary, which derives Marut from a root mar, to shine, labours under two disadvantages; first, that there is no such root in Sanskrit; secondly, that the lurid splendour of the lightning is but a subordinate feature in the character of the Maruts." None of these facts have changed. The verb mṛṇā́ti 'crushes, grinds' is always available to the Sanskrit etymologist but a verb root paralleling Greek marmáirein 'to shine' is absent. Does a 19th-century scholar still have a point? Have Indo-Europeanists gotten ahead of themselves attributing a PIE root behind every relationship blindly? Skepticism concerning this root, in regards to another meaning given to it which strives to explain Greek words relating to 'portion' and 'fate', is echoed more recently by Peter Schrijver in Indo-European *(s)mer- in Greek and Celtic published in Indo-European Perspectives (2004): "Yet the other cornerstone of IE reconstruction beside archaic morphology, viz. comparative evidence from other IE languages, would seem to be almost completely lacking." If मरुत marút may be so etymologized, such that these storm gods 'crush' and 'pummel' with thunder rather than 'shine' through lightning, then surely so may Sanskrit márīci- 'mote or speck in the air' or 'particle of light' be likewise attributed to the homophonous root referring to crushing, grinding and wearing things away. Latin merus 'pure, unmixed, unadulterated' can also make better sense this way too (ie. 'worn away' → 'mere' → 'unadulterated', 'pure', 'bare'). Nothing here requires a source from 'to shine' and the issue seems even to become burdened by extra assumptions when we do. So it really begs the question whether it existed at all in PIE. Perhaps we should wonder from where Greek obtained marmáirein and related words pertaining to 'shining' if not from PIE and resist a biased tendency to see Indo-European in everything beyond what's sensible. Müller, Vedic Hymns, Part I: Hymns to the Maruts, Rudra, Vayu, and Vata (1891) (see link). Schrijver, Indo-European *(s)mer- in Greek and Celtic published in Indo-European Perspectives (2004) (see link). Griffith/Shastri, The hymns of the Rgveda (1995), p.398 (see link). Does anyone else find the PIE reconstruction of *mer- 'to shimmer, to shine' suspicious? For one thing, there are many meanings being given to this single root, each with its own series of cognates. Porkorny listed five separate meanings. The blogauthor of Bradshaw of the Future noted that the American Heritage Dictionary combined 'to die' and 'to rub away' into a single etymon, something that makes perfect sense to me because it would suggest that 'to wear away' is the original sense from which 'to die' is to be derived through metaphor. Presumably these two meanings would have been distinguished by two different conjugations: objective *mḗr-ti 'he rubs something' versus subjective *mór-or 'he wears away; he dies'. Not one cognate shows the unreduplicated verb root and meaning directly. Many things are left unexplained. Taking each branch separately, the verb is weakly evidenced. Some of the cognates can equally be interpreted using a different sense of *mer-. Added all up, there are an unusual number of odd problems demanding special pleading. Is this really a genuine PIE root or is this falsely reconstructed from language scraps? Furthermore, is there a foreign non-PIE root lurking here that might be gleaned from this mess? More later. Puhvel, Hittite Etymological Dictionary, vol.6 - Words beginning with M (1984), p.150 (see link). A hidden story behind Cybele the Earth Mother? From the words of Roller, In search of god the mother: The cult of Anatolian Cybele (1999), p.68: "Thus citations in Classical literature make it appear likely that the epithet kubileya (or kubeleya) was derived from the name of a natural feature of the landscape, probably a mountain." After just writing the previous post and then reading this, I find myself crapping my pants right now. Time for the Depends! Hahaha. Towards the New Year, I had already been scanning through Hesychius' Glossai, focussing on words identified by the author as 'Cretan' in particular, and making detailed personal notes. I'm dazzled by the network of vocabulary that's unfolding before my eyes, much of which is mirroring what I've discovered in Etruscan. I really feel more and more that Hesychius' work, as negligent as he was in marking overtly the language of the words he cited, is a treasure trove of hints that may round out our understanding of the Proto-Aegean language family. I suspect that a common Aegean vocabulary can be reconstructed if we're diligent. A reconstructed Proto-Aegean will simultaneously complement our understanding of Indo-European etymology and weed out falsely reconstructed IE roots like *peleḱus 'axe'. Long story short, In search of god the mother: The cult of Anatolian Cybele shares the fact that Hesychius labelled the gloss Κύβελα as ὄρη Φρυγίας 'mountains of Phrygia'. A short-sighted scholar might assume that the word is thus a native 'Phrygian' word and stop there. However, logically, we must accept that this in itself only suggests to us that the mountains of Phrygia were named this by contemporaneous locals, most of which being presumably Phrygian at the time. In light of my theorizing on Minoan *kapada meaning 'summit', I believe I might be able to answer the questions posed by the author of that book above. The word may be Phrygian, sure, but more fundamentally, it strongly looks like it's of Minoan origin in light of this fact, several other glosses by Hesychius starting with kub-, and the apparent name for Minoa I spoke just a few days ago. I've therefore refined my reconstructions to *kaupada 'head' (with a secondary sense of 'mountain-peak') and thus *Kaupadaria 'Minoa; Land of the (Two) Peaks'. As for the value of *d here, I might be able, thanks to this investigation, to converge on a value of [θ] ~ [ð]. In fact, if I may be so bold, the very Minoan iconography of twoheadedness itself could have been evoking the plural form *kaupadar 'heads' and thus the name of Crete. I'm getting goosebumps. I hope I'm not wrong. Let's talk about the Minoan name for ''Minoa'' (ie. Crete and the surrounding region controlled by Minoans in the 2nd millenium BCE). Although we continue to use Sir Evan's label for Minoans, there's little mystery anymore what we probably should be calling them: Kaptarians. Alas, even so, I don't think the name will catch on any more than Nessite for the technically incorrect term Hittite. We have Kaptara in Mari texts, the Akkadian rendering Kabturi, Egyptian *Kaftiu (kftiw) and Biblical Kapthor. All of these names point to Crete and Minoan civilization. Yet if we know this much, we must ask: What exactly was the Minoan form of the name then and what did the name mean? Solving the 'caput caper', we come back to this name for Crete, *Kapadar, and an interesting value now of 'Summits' or 'Peaks'. But what summits? Why, the divine peaks, of course: Mount Ida (Minoan *Ida I-DA) and Mount Dikte (Minoan *Adíkitu A-DI-KI-TU). 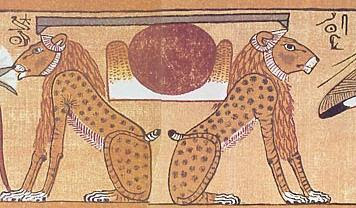 We know these two in particular to be very sacred to the Minoans. 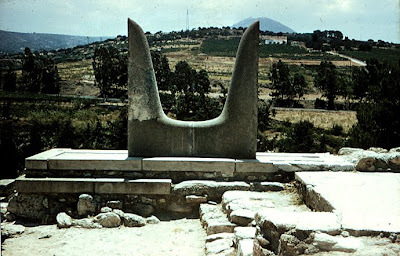 That might explain the Horns of Consecration motif in Knossos, pictured below, which start to look a lot like twin peaks much like the undoubtedly related Egyptian aker symbolism also pictured below. 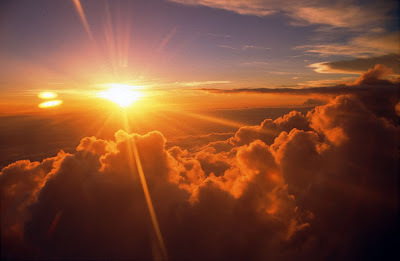 The Egyptian symbol is reverence to both the evening sun as it passes into the underworld and the morning sun as it rises out of it and I doubt the meaning behind the Minoan symbol was much different. Now we see why the value of 'summit' for an Aegean root *kapada works well to tie all of these ideas together. So is it possible that the true Minoan name for Minoa was also the name of an important symbol of their world-view?